help. i need an explanation. is it between young and old? i blew up the photo but am not sure what is on the ground. Two kids playing with a soccer ball. Someone came by and tore a piece out of it. So if we eliminate the stare, we get rid of the fight? No, no. Supposed to be of Chinese life. 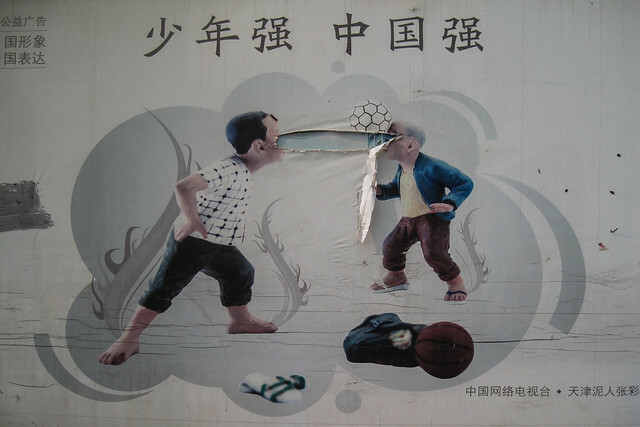 Two kids playing… headbutting a soccer ball. Someone came by and tore the middle out of it; that’s what is hanging.